There is also a long tradition of experimentation with form in Brazilian literature, championed by academia, and it has become common even for more mainstream writers to take a flexible approach to the rules of grammar and syntax. I think that over the years, some of these things have lost their strangeness to Brazilian readers. Although there has been experimentation with form in English-language literature too, I don’t think it has been as widespread, or that the boundary-pushing in Portuguese has been the same as the boundary-pushing in English. The upshot—from a translator’s point of view—is that there are no direct parallels to work with. This means that the ever-so-Brazilian use of commas in the place of full stops (to cite just one of my endless dilemmas) doesn’t necessarily create the same effect when translated into English. It creates a jerkiness in the text that just isn’t there in the Portuguese. I often have to make concessions or adaptations to (try to) recreate the same effect in English. It’s almost like the dilemma in photography, where the camera sometimes doesn’t capture what the eye sees. Do you use a special filter to replace whatever has been lost, or do you leave the photograph unadulterated? From the point of view of translation, I prefer the filter, if it helps me get closer to the effect of the original. EB: Brazilian literature is still largely an enigma to Anglophone readers (unlike the literatures of France or Germany). Whereas your average reader in English probably studied something of the histories of those countries in school, the history of Brazil isn’t something that average reader has been exposed to, despite the consistent presence (one might even venture to say interference) of first the British and then the Americans in Brazilian history (an from which a wonderful phrase, still in use, comes to us—para inglês ver—to express the one’s giving a false impression of things). This makes certain literary references to Brazil’s past more difficult to translate for the English-language reader. Do you come across such challenges frequently? How do you approach this in your translation? AE: I haven’t had too many problems with this, as most of the works I’ve translated have been contemporary. I am also not a huge fan of footnotes, nor are most of the authors whose work I translate (and I always consult them as to their preferences). I am not averse to occasionally introducing an extra word or phrase for clarity where necessary. But I think that most things are what they are and can be inferred from their context. If a reader wants to know more about a certain aspect of a country’s history or culture, it is so easy nowadays to look it up. So I don’t feel a great urge to explain. Take City of God by Paulo Lins, for instance. Brazilian readers of the novel are as alien to life in a favela as most foreigners. Most of them have never set foot in one, much less lived in one. The slang used in the favela in the book is particular to that time and place. It is as transparent (or not) to contemporary Brazilian readers as it is to readers of the translation. And, as you read, the meaning of certain things becomes apparent from the context anyway, in both the original and the translation, so I didn’t feel a need to interfere. I did include a very small glossary of terms, mostly to do with the Umbanda religion, which is something that, culturally, English-language readers wouldn’t have access to. Another example is Chico Buarque’s Spilt Milk, which spans a large chunk of Brazilian history. Most contemporary Brazilian readers didn’t live through those times either, and yet things are fairly self-evident from the context, I believe. EB: English is often celebrated for its acculturating ability and a malleability that allows it to incorporate influences from many different languages. Interestingly, Brazilian Portuguese is every bit as malleable, in large part due to both the political and cultural colonialism that has defined Brazil’s history. AE: So far (knock on wood), I haven’t come across many instances where the use of foreign words in Portuguese have posed a problem for the translation. Eulálio, in Spilt Milk, likes to throw in a bit of French to sound posh, which I imagine was a problem for the French translator, but most of those words worked in exactly the same way in English as they did in the original. I recently translated a children’s book by Eva Furnari (Fuzz McFlops, in English), where there was an instruction manual in Portuguese that was a send-up of English, with English suffixes on Portuguese words. It was hilarious in the original but wouldn’t have made any sense in the English so, in consultation with the author, I dropped those things from the translation and focused on other ways to maintain the humour. 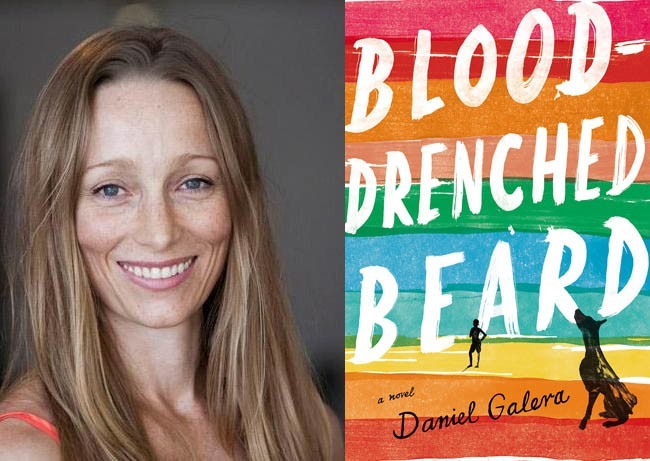 ER: Tell me a bit about your most recent translation by Brazil’s literary rock star, Daniel Galera, entitled Blood-Drenched Beard (Penguin 2015). AE: Blood-Drenched Beard is unlike any other Brazilian book I’ve ever read—it steps outside of all I know about Brazilian literature. To be honest, at first I wasn’t sure if the slowness of the book would work in English, but the further I went, the more hooked I became. It’s a sprawling, epic journey of a book—very moving and funny—that seems to take place in real time, and at the end of it you really feel as if you’ve spent a year in the life of the protagonist. And yet, strangely, I can remember every last detail of it, so it is definitely one that has left its mark on me. It wasn’t the most difficult book I’ve translated, though there were some tricky moments, as is the case with all books in translation. The only thing I lost a little sleep over was the fact that the protagonist is unnamed in the book and is usually just referred to with the pronouns “he” or “him”. In Portuguese, the verb conjugation often tells you who is doing what, so there wasn’t a need to pepper the text with pronouns. But in English, in most cases, we need subjects for our verbs, so there was suddenly a profusion of “hes” where there weren’t in the original. Most of the time it wasn’t a problem, as “he” is fairly invisible to readers in English, but in scenes where there were other male characters, things got a little complex. I found myself recasting sentences to avoid unnecessary confusion, which took some doing. Luckily, there weren’t too many scenes like that.